MIDDLE BURY, VERMONT — Carl Roesch and Caetlin Harwood had owned the diner in downtown Middlebury for just six weeks last spring when they were introduced to one of its biggest annual traditions: the early morning breakfast for graduating seniors at Middlebury College. But the staff had experienced it before and the kitchen methodically turned out plate after plate. The waitstaff placed pitchers of water on the tables and diners were served with plastic cups — no glass. After devouring their breakfasts, the crowd of students rolled out the door. Two hours later, many of the students’ parents arrived, looking for breakfast of their own before commencement. “They had no idea that their kids were in here earlier and the condition they were in,” Harwood said with a laugh. The learning curve for owning your first restaurant is steep, and steeper still, when your institution is as steeped in tradition as the diner on Middlebury’s Merchants Row. While the diner doesn’t sport the classic diner look of polished steel and neon tubes, The Diner — as it is now titled — has gotten a makeover with newly tiled floors, reupholstered booths and a new coat of cream-colored paint. The entrance features a stylish sign with the restaurant’s new name. 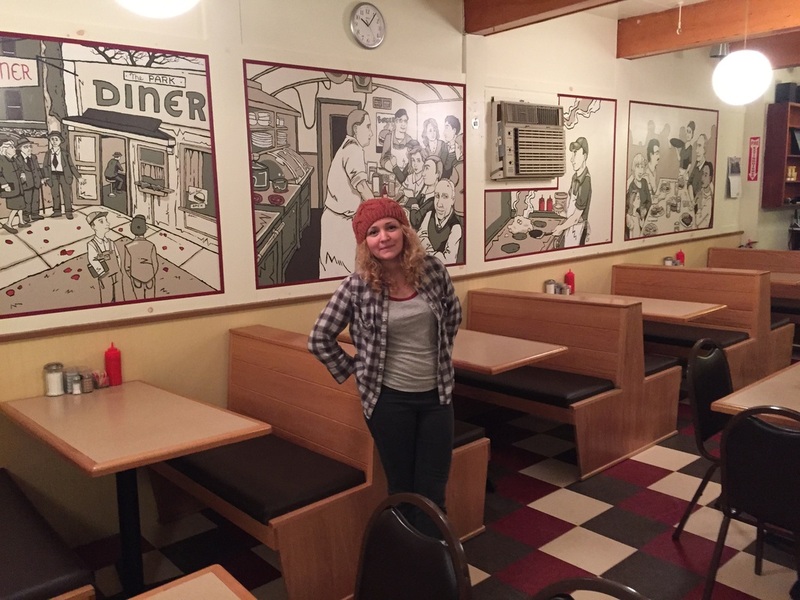 As part of its latest chapter, the diner this past week unveiled another update: a mural covering one wall that depicts the history of the diner as well as its patrons and owners for over 50 years that the diner has been in Middlebury. Roesch and Harwood had the idea for a mural while looking for historic photos of the restaurant’s earlier days. Before Steve Dow bought the restaurant from Corrado Salini in 1989, the diner had already enjoyed a long and illustrious history, first arriving in Middlebury on the bed of a train in the 1930s. The space has seen a string of owners and sported a string of names including the Park Diner, Steve’s Park Diner, Smith’s, the Lemon Fare and finally The Diner. Late this past summer, Harwood reached out to Grillo, a friend and freelance artist and illustrator based in Brooklyn, N.Y., to create the mural. The two hadn’t been in touch since their high school days at the Gailer School in Shelburne but were able to reestablish contact through Facebook. Grillo took on the project. Harwood and Grillo scoured online databases, newspaper and magazine articles, and black and white photos supplied by local residents for material. After several drafts and sketches, which she sent to her counterparts at The Diner, Grillo created digital samples, which acted as a blueprint. She came up with five panels that span 20 feet. She painted the entire work over five days; drawing the images by hand, scanning them onto a computer and then projecting the images onto panels to be painted. “That was pretty intense, but once I stepped back and looked at it, it was definitely a good feeling to have accomplished it,” she said. Harwood and Roesch’s original plan was to continue operating the restaurant and gradually implement some changes like the new floor, paint and entrance, but the owners felt the need to expedite their plans only a few weeks after opening. “We felt we had to put our own stamp on it,” Roesch said. In addition to the mural, they’ve also updated the menu with a few newer items. In addition to typical diner-fare options, they’ve introduced a few creative options. The Popper combines cream cheese, bacon and jalapeno jam with French toast while the Yum Yum Naan features Korean beef with Asian slaw on a pita. With the mural installed at the end of December, the owners say they would like to spend more time reaching out to the various groups of people that call the diner home, be they tourists, students, or locals. “This first year has been setting the whole thing up, now we can focus on that,” Roesch said. As for running their first business, the two say they’re learning every day.